Hot water tank failure - RJ Kuhn, Inc.
mind. Water that comes out of the heater is factory set to 125 degrees; this is hot enough to scald skin. Adjustments can bring he water to in excess of 180 degrees. Water heaters are designed to control the flow of gas or electrical energy in a way that safely brings the water to a higher but useable temperature. Changing or modifying a water heater can have injurious or even deadly consequences. There are multiple ways that water heaters can leak. If water is leaking from the fittings attached to the hot water tank, or from the relief valve, it may be repairable. If it is leaking from the tank itself, your tank could be corroded and will need replacing. If water is pooling at the base of the heater, check the water lines attached to the top of the heater (some heaters have side connections) and check the bottom of the pipe connected to the relief valve. If water is dripping from the pressure release valve it could be due to temperature or pressure exceeding the valve’s rating. Never attempt to cap or plug this valve or the pipe that directs the water to the floor. This valve is critical for the safety of you and your property. It keeps the water heater from becoming a bomb. If the valve isn’t faulty, the problem is usually a buildup of scale on the temperate probe of the gas valve. If this is occurring the heater is overheating and the relief valve is doing its job. Simply replacing the relief valve will not solve the problem. The gas valve can be replaced, or depending on the age and condition of the heater, it may be prudent to replace the entire heater. If the leak cannot be seen or found, then it is likely occurring from the tank under the jacket. Turn the water of at the valve on the supply line and turn the gas or electric off to the heater as well. Very rarely does a water heater have a catastrophic failure. The leak will usually occur gradually over time. Taking pictures and making a well-placed phone call to an expert will help get the problem solved when it works best for you. If you find the leak on a Sunday for example, don’t let a so-called professional tell you it has to be replaced at double time. Although this could be what needs to happen, there are usually ways to get through until Monday. I counsel people all the time on ways I can help them over the phone instead of taking advantage of the problem. 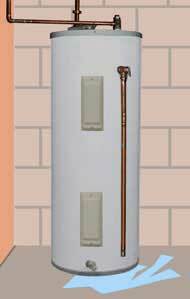 If you have questions about your leaking water heater, call RJ Kuhn Plumbing Heating and Cooling at 630-554-3336. Thank you for your honesty when servicing my air conditioner. When I called, I thought I was needing a new one and I wouldn’t have known any better.